Debuted at this year's CES in January, the HMX-R10 was something of a revelation - a Full HD camcorder that's touted as the world's smallest. Samsung's 9MP shooter offers Full HD 1920x1080p resolution, houses a 5x optical zoom and even doubles up as a 12MP digital stills camera – although this can only be reached through interpolation. All this is backed up by a CMOS sensor, measuring 1/4.5 inches. The main selling point is the cam's size, weighing just 229 grams and having the miniscule dimensions of 130x38x58mm. While some may baulk at the look of the camera, the reason Samsung have placed the lens at such a jaunty angle (25 degrees) is so users "can grip the camcorder in a more relaxed manner." This should mean it will put less pressure on your wrist and elbow when filming your subjects. So you can view your movies, there's also 2.7-inch LCD flip-out monitor included. The HMX-R10 Camcorder is out in the UK in April. 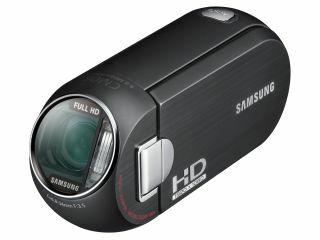 Pricing has yet to be released, but visit samsungcamcorder.co.uk for more details.